Where did Virtual Rescan Technology go? I have personally been selling PC’s, PC Peripherals and scanners since 1995. When I came to ImageSource in June of 2000, I had to learn the document scanner side of things. ImageSource was definitely an early adopter of the VRS (Virtual Rescan) Technology. This insight was driven by being close partners with Fujitsu and Kofax. In the beginning, you had to have extra hardware components in the scanner and host PC to make the equation functional. The installations were clumsy at times, but it really was the best way to get the best quality image from your scanner. 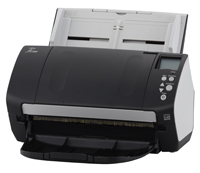 The new Fujitsu Scanners consisting of the fi-7160, fi-7180, fi-7260 and fi7280 combine new features such as “Acoustic Paper Protection and Skew Prevention” technology with faster speeds. The fi-7180 and fi-7280, which includes a flatbed have speeds of 80 pages per minute and 160 images per minute while the fi-7160 and fi-7260, also includes flatbed, have speeds of 60ppm and 120ipm.